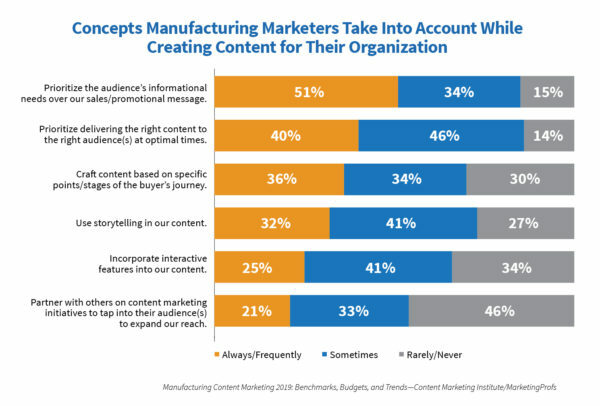 According to our new research, Manufacturing Content Marketing 2019: Benchmarks, Budgets, and Trends sponsored by IEEE GlobalSpec, only half of manufacturing marketers always or frequently prioritize their audience’s informational needs over their sales/promotional message while creating content. The report highlights the responses from for-profit manufacturing marketers who took the CMI/MarketingProfs ninth annual content marketing survey. Comparing the manufacturing marketers’ responses to the broader set of B2B North America marketers does not yield an apples-to-apples comparison. 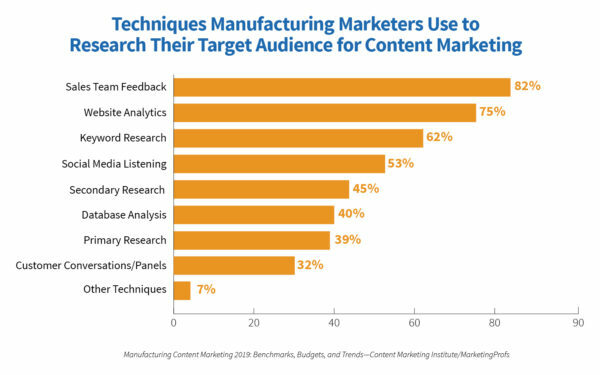 Still, it’s worth noting that the 51% of manufacturing marketers who regularly prioritize audience information needs is quite a bit lower than the 73% of B2B North America content marketers who do. There’s a clear way for manufacturing marketers to turn around their perspective: Stop creating content without first understanding and prioritizing the audience’s information needs. There’s no use in throwing more money at content marketing if you aren’t developing content designed to provide valuable information that your audience needs. To do that, you have to first understand your audience. Defining your audience (including developing personas and understanding what content they need at each stage of the audience journey) is one of the key steps in developing a content marketing strategy. Only 21% of manufacturing marketers report that they have a documented strategy. And only 39% of manufacturing marketers surveyed have personas, though another 27% expect to have personas developed by the end of 2018, bringing the total to 66%. A documented strategy without broad organizational support won’t do justice to anyone’s content marketing initiative. If focusing on your sales message is a broader issue in your company (i.e., your marketing team is conditioned to do this just as your corporate and/or sales team), it’s going to take hard, deliberate work to get everyone focused on the audience’s needs. One of the first steps is to conduct research to really understand the people within your “audience segments” as humans. Talking to people within your niche is a great way to get this understanding. Yet less than half (42%) of B2B marketers overall use this technique to research their audience. 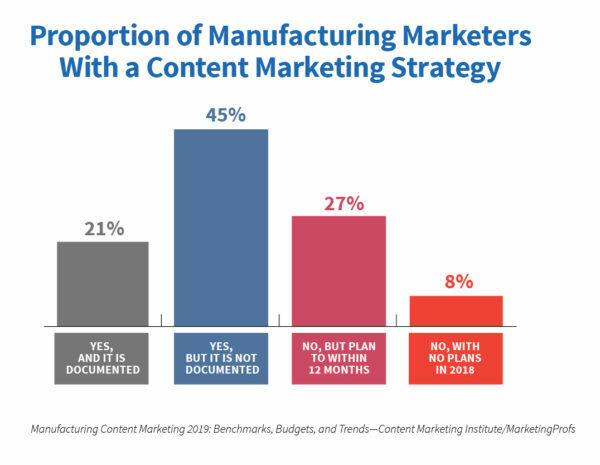 Among content marketers in manufacturing, that percentage is 32%. Still, having a solid handle on the audience is especially difficult for manufacturers. 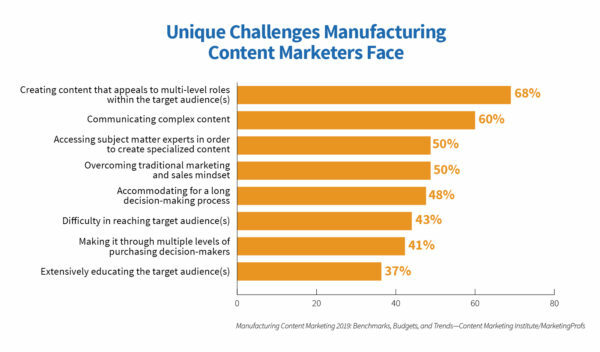 We asked content marketers working in manufacturing what unique challenges they think they face in comparison to other content marketers. Their top answer was creating content that appeals to multi-level roles within the target audience(s). The way decisions are made presents a big challenge for content marketers too, says Achinta Mitra, founder of Tiecas, an industrial marketing consultancy. Buying decisions are made by a committee and very rarely, if ever, by an individual,” he says. “Some of these stakeholders may never interact with your content or visit your site. In most cases, Achinta says, there are different kinds of buyers with different needs: the specifier and the functional buyer. Their challenges and content needs are different. Complicating the scene even further is the hidden role of internal gurus. These influencers often remain invisible for the better part of the buying journey but can quickly scuttle a promising opportunity. “Your sales team won’t meet them and/or find out about their objections until the very end,” Achinta says. And champion content, as Achinta calls it, always focuses on audience needs – not the company providing the products and services. 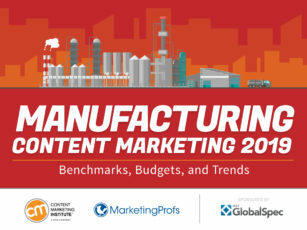 To learn more about how manufacturing content marketers approach their craft, view the report. Make sure to circle Sept. 3-6 on your calendar so you can attend the Manufacturing Lab at Content Marketing World 2019. Sign up today to be notified when registration opens.